The start of the conversation, with Gislain Aucremanne on stage. I was lucky enough to snag a spot for one of the two Evening Conversations hosted by L’École Van Cleef & Arpels last month. The one I attended was titled “Inspiring Feathers through Jewelry,” and as much as I love feathers and birds, both real ones and the jewelry kind, I knew I had to be there! Since the successful run of conversations in June 2015 at the Cooper-Hewitt, in connection with the gemological and design classes offered, L’École Van Cleef & Arpels returned this year in February and October with three (free!) conversations spread out in three different locations—the Hearst Tower, the New York Academy of Art, and Bonhams New York. The conversation I attended was a wonderful event held at the New York Academy of Art. It started with a lovely cocktail reception with champagne and hors d’oeuvres. I met the director of the academy, David Kratz, who graciously greeted and chatted with so many attendees and who mentioned that Van Cleef & Arpels was a great partner and he’d be happy to have another Evening Conversation take place there. I hope they take him up on his offer since the audience has grown substantially since the lectures I went to in 2015. I think they are going to need a rather large auditorium from now on! Before the evening got underway they did a test run of the slide show. The conversation was led by Inezita Gay-Eckel and Gislain Aucremanne, both Paris-based professors at L’École Van Cleef & Arpels, who have great chemistry together and really keep the talks ebullient, informative, and fun. I found it fascinating to hear from them how feathers have been used in jewelry throughout time and in many different cultures to celebrate the freedom birds have with their ability to fly. Feathers have also been used by many societies to designate who had the power or was considered an important person. Gislain discussing the legend of Icarus. I liked the inclusion of Icarus, especially next to a picture of a necklace that looks almost ancient in some ways but is actually a modern design! The pictures below show a Aztec headdress made using Quetzal feathers, left, and the King of Nepal’s crown, right, featuring feathers from a bird of paradise. Feathers used in crowns of the Aztecs, left, and the King of Nepal, right. The King of Nepal’s crown. You cannot get a sense of just how large the crown is until you see it worn. 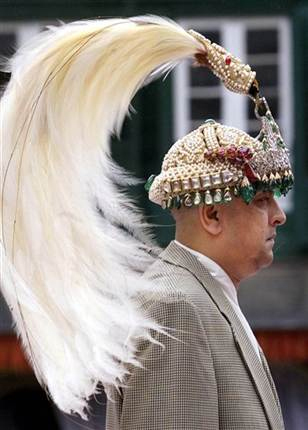 The photo below is one I found online and the site says it shows King Gyanendra wearing it. In researching this photo I learned Nepal no longer has a king. Gyanendra was that king until 2008 when the monarchy was abolished. I hope he got to keep this stunning crown! The King of Nepal wearing his crown. Wow! Photo source. Inezita and Gislain said François I of France used feathers as a crown in the 1500s to illustrate he was the king—they also said Henry VIII liked this idea so much (and felt so competitive toward François), that he adopted the use of feathers too! In Native American cultures, Inezita and Gislain mentioned feathers were given as rewards for good deeds toward the tribe, so if you had a headdress full of feathers it indicated you had done a lot for your people. And feathers were so expensive in the late 1700s that Louis XVI found it cheaper to give Marie Antoinette a diamond feather brooch than actual plumage for her elaborate headdresses! If you wore the feathers, you had the power! This picture shows the two screens (and the Empress of China’s crown) and Inezita, the other host for the evening. My favorite slide of the night featuring the Van Cleef & Arpels “Kingfisher Necklace” and the Kingfisher bird himself! 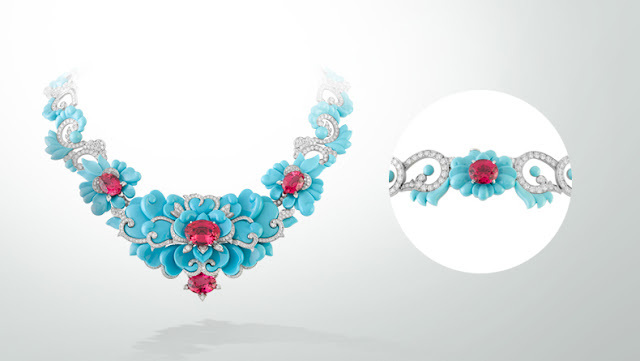 A knockout piece shown in the slide above is the stunning Van Cleef & Arpels “Kingfisher Necklace” from (I believe) 2011 of turquoise, spinels, and diamonds. It was from the “Bals de Légende” collection, celebrating five famous masked balls of the 20th century and this piece in particular was inspired by “Le Bal Oriental,” a famous ball that took place in Paris in 1969. The turquoise came from the same piece and Inezita mentioned that it likely hailed from the Sleeping Beauty quarry in Arizona. The Van Cleef & Arpels “Kingfisher Necklace” (and clasp, right). And yes that IS the sound of me weeping you hear! I was also crazy for the “Question Mark Necklace” on the right, by Boucheron. The slide above shows a gorgeous “Question Mark Necklace” by Boucheron on the right and I believe Gislain said that was a Jean Schlumberger for Tiffany & Co. brooch on the left. 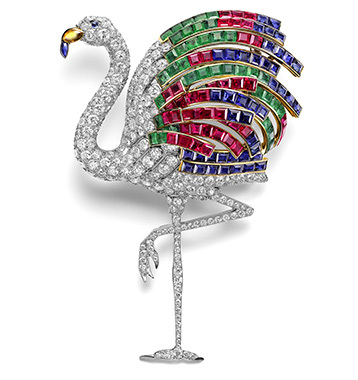 My other favorite slide of the evening showed two of the most glorious bird brooches ever created, both by Cartier. The brooch on the left is the “Bird of Paradise” brooch (as I’ve read it’s called), from 1948, containing over 83 carats of diamonds. Uma Thurman wore the brooch earlier this year to the Met Ball. Inezita and Gislain did not mention this, but I remember it since all the jewelry fans on Instagram went wild to see it on her. Me included! 1948 Cartier “Bird of Paradise” Brooch. Photo by Cartier. Uma Thurman wearing the brooch at the 2016 Met Gala. Gorgeous! Photo by Getty Images. 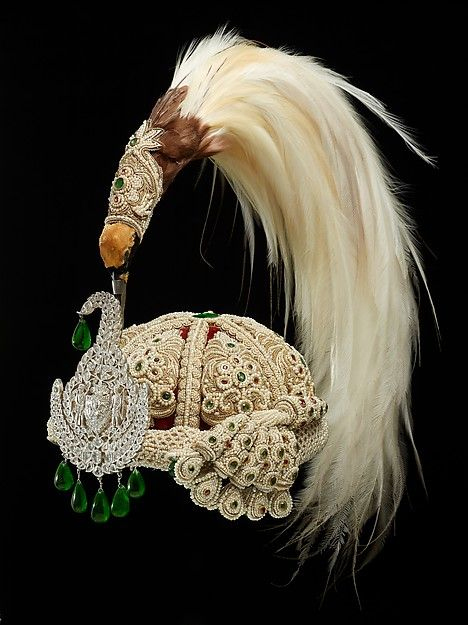 And of course you can’t talk about brooches celebrating feathers without including a piece owned by the Duchess of Windsor, especially her famous Cartier “Flamingo” brooch from 1940, so I was happy to see it included alongside the “Bird of Paradise” clip. I never get tired of seeing it. The Duchess of Windsor’s 1940 Cartier “Flamingo” brooch. Photo by Cartier. Gislain, who was so charming as to go around during the cocktail reception introducing himself to people, said that the October lectures would be the last of 2016 but that L’École hoped to return in January or February 2017 to host more Evening Conversations. I will keep you posted! If you are in Paris, the Evening Conversations are regularly offered and you should go if you get a chance. They are truly special events and you will not only learn a lot but have a great time as well! In the meantime, Inezita and Gislain wanted everyone to know that L’École has a YouTube channel featuring short videos they have made on all sorts of jewelry-related subjects. Click here to see the list and to enter their world of jewelry and watch-making! I had no idea of the vast size and scale of that gorgeous brooch that Uma is wearing...what a statement piece! Gorgeous gems and an interesting back story, thank you for sharing it. Interesting about feathers and as I alluded to before Uma looks fab, dress a winner, but wearing what looks like a heavy Medieval Dagger sans sheath overwhelms everything else beautiful though the piece may be....back to the display case or return to Queen Kong. What a great event! I really love the Duchess of Windsor's brooch! Oh, that Kingfisher necklace. It is one of my all time favorites. It is a stunner. Wow for the Kingfisher necklace!! The colors and workmanship are fantastic. Thanks for the great info, Jill.